That alligator—or caiman, a relative of the alligator—that has been hanging out in that Stirling-Rawdon Pond near Belleville for the past couple weeks may soon be captured (see the picture at left taken by Stirling-Rawdon resident Ron Main last Friday). 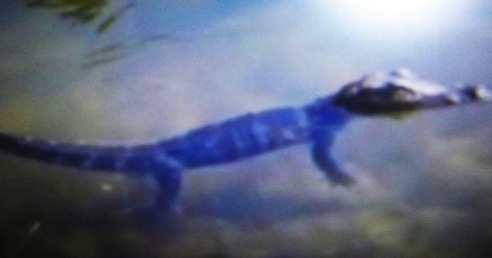 The Ministry of Natural Resources has commissioned Bry Loyst, curator of the Indian River Reptile Zoo near Peterborough, to capture the metre-long reptile, which is no threat to humans. Bry Loyst pictured with Terri Irwin“The last (option) would be jumping on it like Steve Irwin, the crocodile hunter,” Loyst tells the Toronto Star, explaining he’ll use a snare and lasso to catch the caiman, which he'd house at the non-profit zoo. The caiman was likely a pet that someone got rid of.